Back to my story... Fortunately my sister who lives a few blocks away didn't have work so I asked her to accompany me to the nearest clinic because I just wanted to make sure her cut was dressed up properly and of course to make sure that everything was alright. We went to this small hospital along C.Reymundo in Pasig. It was pretty decent. It was no TMC or St. Lukes but it looked clean. 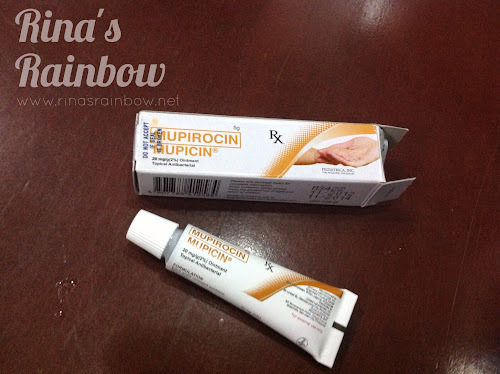 They checked Rain's cut and the ER doctor prescribed Mupirocin. He says this is a good ointment for cuts for the whole family. Then he asked me to be the one to buy it from the pharmacy beside the hospital. Okay fine. Good thing the pharmacy was just a few steps away. To be fair, they did have gauze and medical tape. I still insisted they dress up Rain's cut even with the gauze because I didn't want her to accidentally eat the ointment in case she puts her hand in her mouth. I spent P400 for the hospital's ER service. Excluding the ointment which was around P250. Hay life! Aside from sharing the crazy hospital experience, I just wanted to say to first time moms that accidents happen. Especially for toddlers. Try not to beat yourself too much. No matter how hard we try to protect them, you can never tell when an accident might happen. We're not superheroes, or Cullen Vampires. Just keep calm and focus on the remedy. 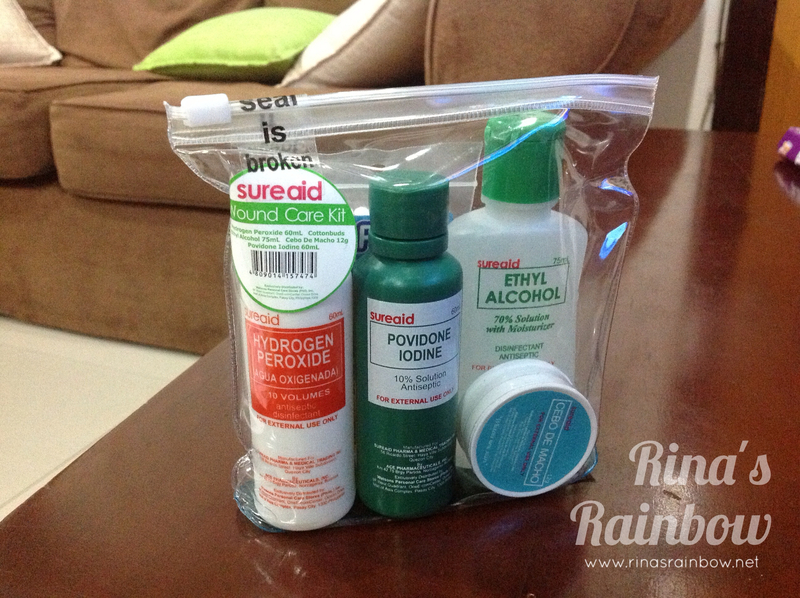 Mura ng first aid kit no? :) sulit!!! In a few minutes, nasa playing mood na sila..that's why you'll know something is really off pag matamlay at wala silang gana.. pag higa lang ng higa..
but wait a few more years, and they'll know that drama is a powerful tool! I've had child patients who wanted to stand up and play a few hours after major surgery. Unlike most adults(including me) na akala mo end of the world na konting taas lang ng temperature..
Now a question you may or may not answer ^_^ Sino mas mahirap alagaan at mas madrama pag may sakit, husband or child? I'm sure majority of wives have the same answer. It's not yuor fault, love. You're an incredible mom, but with our situation, it's impossible to have your eyes on her 24/7. Time to work our next project.. Baby Proofing! Ever since she could understand (actually even before she could), I've always told my baby to stay away from electric fans. I keep repeating myself over and over, pointing to the fans, "No touch, Keia. Ouchie!" Unfortunately one time, she was fixing her hair and had her back to the fan. While raking through her hair, her finger slipped into the fan, and a loud noise erupted causing her to jump in surprise. Thank God, she had withdrawn her finger immediately before it could cause some cuts or bruises. 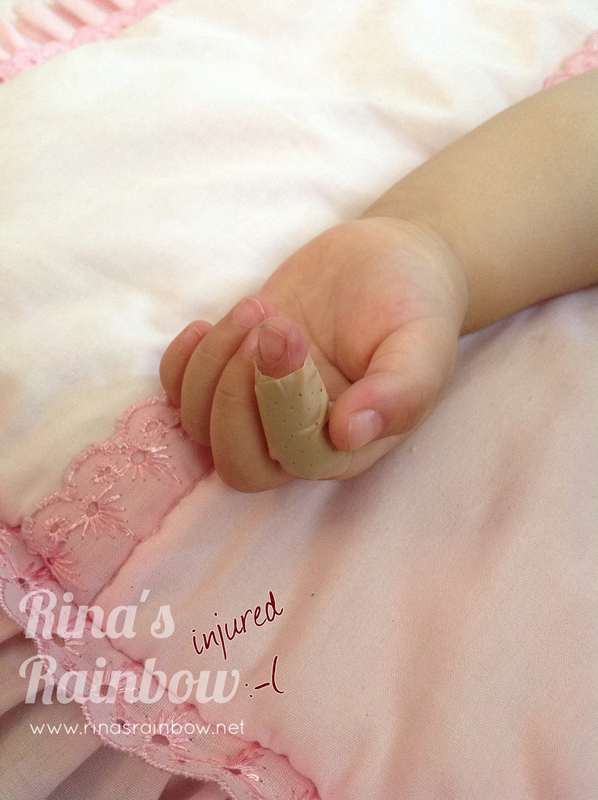 But it still was a bit ouchie because she kept holding and rubbing her finger after that. Good thing the fan blades were plastic, too, better than if they were metal. Still, I put on a net cover for the electric fan so it won't happen again. We really can't focus our eyes on our kids every second, and it only takes a second for those things to happen. So whatever we can do to lessen the chances of these things happening, we do. Hi Guia! Very true! No matter how we try, we can't always stop an accident from happening. I know we should have done it a long time ago but we really really need to baby-proof the house.